The keto diet is essentially a high-fat diet – meals are 70 or 80 percent fat, plus about 20 percent protein; and about 5 percent carbohydrate. Americans spend more than $60 billion a year on methods to lose weight including numerous weight loss products, gym memberships and diet plans. There are an overwhelming number of diets, and choosing the right plan can often be so taxing that in the end no plan is chosen. One of the most popular diets today is the keto diet. Its popularity is such that Weight Watchers’ recent financial outlook was described as bleak following a significant drop in its stock price. The company blames this on the popularity of the ketogenic diet, described as the “keto-surge” by its CEO. 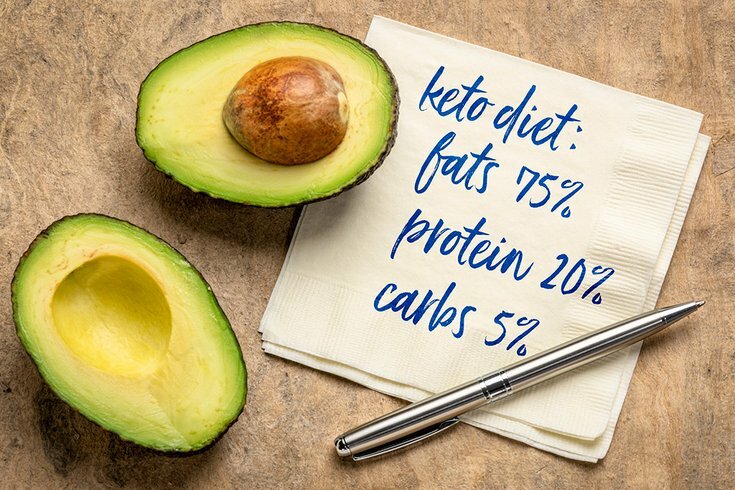 Further evidence of the popularity of the keto diet was a recent Wall Street Journal article titled “Your Avocados and Olives Are Pricier Because Fat Is In Fashion.” This article describes how farmers are struggling to keep up with the demand for foods rich in fat such as avocados, butter and olive oil due to increasing demands, the result of an increased appetite for fats and the basis of the keto diet and high prices for these products. The body gets most of its energy from carbohydrates in the form of glucose, which can be used immediately as a fuel. When glucose is in short supply, the body resorts to an alternative source called ketones, and thus where the “keto” in ketogenic comes from. Ketones are produced from fats by the liver when there is little glucose and serves as a good source of energy, particularly for the brain. On a ketogenic diet, the body is burning fats, a term called ketosis, to provide the necessary energy for bodily functions. With fat burning comes weight loss. The same effect occurs with fasting. The concept behind the ketogenic diet dates back to at least 500 BC when fasting was used as a means to treat epilepsy. The modern use of starvation diets as a mechanism to treat epilepsy and limit seizures was reported in 1911. To mimic the mechanism of fasting, a ketone-producing diet, low in carbohydrates and high in fats, was introduced in the 1920s along with the term ketogenic diet, by Dr. Russell Wilder from the Mayo Clinic. This diet was used widely to treat epilepsy in children for several decades until the introduction of antiepileptic agents. In the late 1990s that diet made a resurgence, once again, as a treatment for epilepsy and more recently has received attention in the mainstream public as an effective means to lose weight. Proponents of the keto diet claim that ketosis provides an unlimited supply of energy and, in doing so, avoids the glucose swings associated with carbohydrates. These benefits are touted to enhance mental and physical endurance and at the same time facilitate weight loss. Dr. David Fischman, top, and Dr. Michael Savage are cardiologists with Thomas Jefferson University. Whether a low-carbohydrate diet results in more weight loss compared to a low-fat diet remains controversial. Studies have shown that initially there is a greater weight loss due to water loss, but long-term (six months) there may be no difference despite the fact that people on a low-carbohydrate diet may end up eating fewer calories overall due to the limited food selections with this plan. The low-carbohydrate diet may be good for Type II diabetics with better control of the Hemoglobin A1C in addition to lowering triglycerides, raising the good cholesterol and lowering blood pressure. The combination of high triglycerides, low HDL and high blood pressure have been linked to heart disease. On the other hand, this high-fat diet may result in elevation of the LDL cholesterol, which is not good if you are a heart patient. Less concerning, but bothersome side effects of this diet are cramps, constipation, diarrhea, irritation, headaches, bad breath and insomnia. These symptoms have been labeled the “keto flu” and can last for several weeks until the body becomes accustomed to ketosis. In a recent U.S. News & World Report article, the keto diet ranked among the top in best fast weight loss diets but near the bottom in best overall diets. Despite being around for decades, there is still much we don’t know about the keto diet. Therefore, before embarking on this diet it is best to discuss it with your own physician to know if it is the right choice for you. Dr. David L. Fischman, professor of medicine at the Sidney Kimmel Medical College of Thomas Jefferson University, and Dr. Michael P. Savage, the Ralph J. Roberts Professor of Cardiology at Thomas Jefferson University, are co-directors of the Cardiac Catheterization Laboratory at Thomas Jefferson University Hospital. They write occasionally on topics related to heart health.